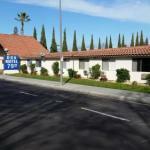 Located 4.8 km from SAP Center this San Jose motel features an outdoor pool and hot tub. All rooms provide a cable TV with HBO film and ESPN sports channels. Free guest parking is available. Each air-conditioned guest room at EZ 8 Motel San Jose I includes a refrigerator. For convenience each room includes a work desk and ironing facilities. Guests of EZ 8 Motel San Jose 1 are offered a 24-hour reception. A business centre with fax and photocopying services is available. A guest launderette is located on-site. San Jose International Airport is 7 minutesâ?? drive away from this motel. Within 4 miles of EZ 8 Motel guests will find San Jose Convention Center and San Jose State University.